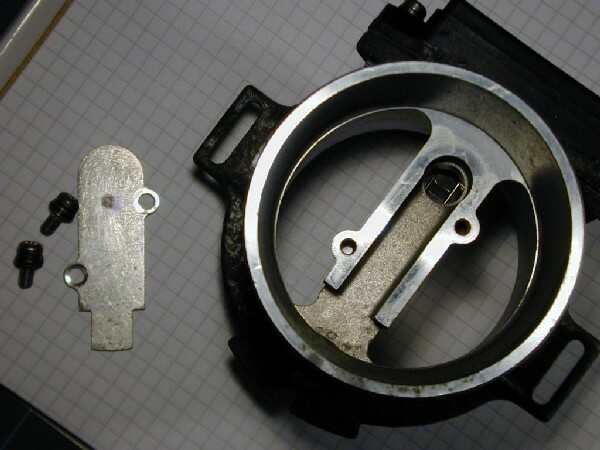 Recently an owner, Craig, was obliged to change a faulty MAF sensor and Martyn H took the opportunity to dismantle the faulty one and investigate its internal properties. Was it possible to repair a MAF, he wondered? This is his report. OK, so you have cleaned your MAF and the electrical connection and the problem hasn't gone away. 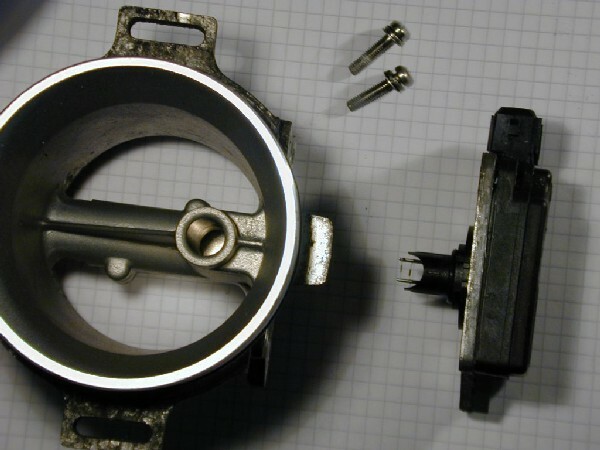 A new MAF costs the best part of 100 pounds, so you may want to attempt a repair and you certainly want to check that it really is the problem before trying a new one. An OBD lead makes this fairly easy, and it is easier still if you can find someone with a working car and MAF of the same model as yours. Both MAFs should read about the same when quizzed by the OBD, under the same circumstances. If one is dirty, the reading may be off, this is normal and cleaning should restore the readings. 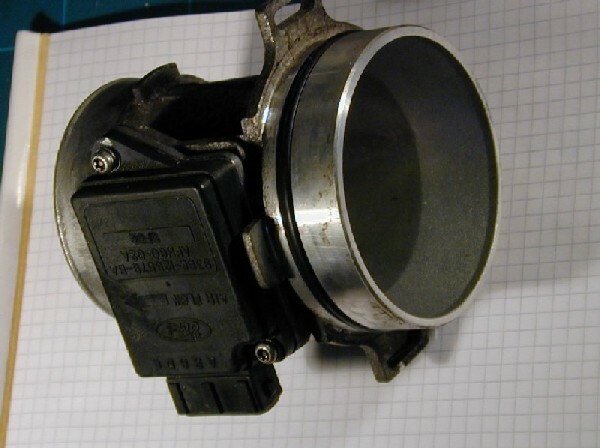 The 24v and 16v have a different inlet tract and different MAF housing, however, the actual module is identical in images, and they perform the same function, measuring the air pressure in a small tube inside an inlet tract. It would be interesting to learn if a 24v and a 16v (and also a 8v or 2.3 MAF) are the same module with a different housing. This would mean a 24v owner could trouble shoot with a 16v owner. This would also mean a MAF can be bought from Ford, suitable for any of these models and the module within the unit can be swapped for the one in the faulty MAF. Warranty would make this unwise at present, but if supplies for one particular model dry up or you are searching a breakers yard for the unit, this would be well worth finding out. If the working MAF works in both cars, and the faulty MAF shows the same fault in both cars, that points clearly to the MAF. If neither MAF works in a particular car, that points to the wiring in that car. Up to this point, maintenance of the MAF has comprised cleaning the wires in the sensor tube using carb cleaner or similar. This is intended to be a safe procedure. If cleaning is not enough, then an alternative to buying a new MAF, is to attempt a repair on the old MAF. This is not safe for the MAF and is at your own risk. But it can be successful. By removing the back plate, you will change the characteristics of the MAF and probably shorten the life of the resistors. 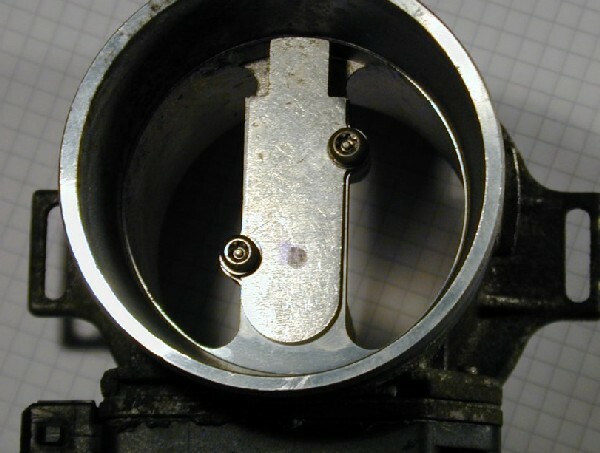 The back plate can be checked without dismantling the unit. As a first check, see that the faulty MAF does have a back plate. Ask on the Forum for a replacement, it isn't available separately from Ford but can't really go wrong so spares ought to be available via the Club. Ford used tamperproof screws to hold the backplate and module onto the MAF housing, you need a type T15-H screwdriver bit to unscrew these. Note that air passes through the tube containing the wires, and then up the shaft to the opposite side of the housing before continuing to enter the intake. This reduces airflow through the tube. If there is soot or some sort of blockage in this tube, airflow through the MAF sensor will be even lower. Since the device works by measuring a part of the net flow, restricting the part still further will reduce the readings for a given airflow. Conversely, removing the back plate will permit more air to pass over the wires for a given airflow and will result in a higher than correct reading. 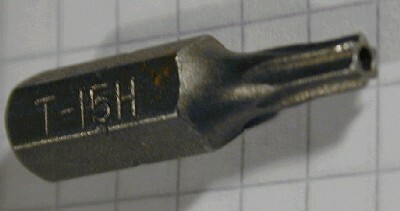 Note the rubber sealing ring on the base of the plastic shaft. The module may be a little hard to remove initially. Be careful if you do this, the wires are unprotected. 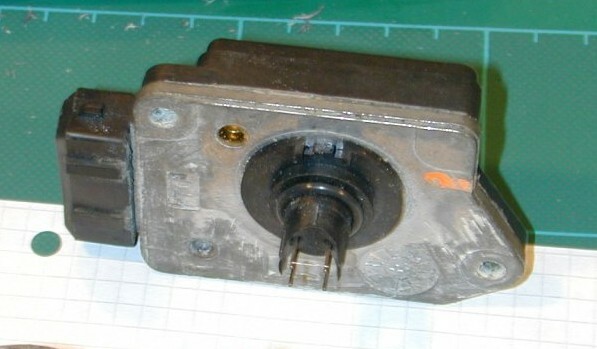 As you can see, there are two wires, one mounted high on the pins which the airflow reaches first, and one mounted lower down on the pins which is second in line. Air heated by the higher, first wire, will then warm up the second wire. I don't know why there are two wires, the designs I can see ought to be no worse with one, so I suspect the second wire is there to add some sort of compensation effect. Whatever the facts of the mechanism, the properties are easier to get at. The resistor you can see, has a resistance of about 20 ohms at room temperature, and the resistance varies with temperature, when the wire is hot, the resistance goes up, finger temperature seems to be enough to lift the reading a few ohms. Both wires appear to be the same. 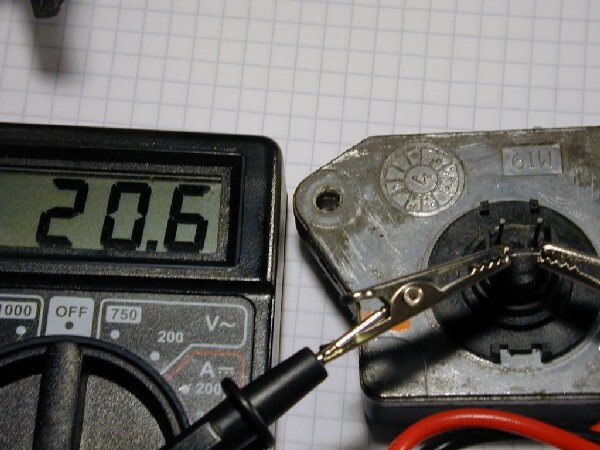 Measuring the resistance is easy, just clip a multimeter to the shafts of the wire you wish to test. There doesn't appear to be a reading through the circuit board. I haven't tried this on a working MAF so I don't know if this measuring act damages the circuit board, comments from those who might be able to guess better are welcome. I tried putting the unit into the freezer and measuring again, this seemed to have minimal effect on the resistance, maybe half an ohm down on the earlier reading. The shafts are solid, you'll have had something bad happen if these are broken. The wires on the shafts are not nearly so rigid, so any physical damage is likely to be in this area. Repairing the damage in this area ought to be possible. With the module removed from the housing, it would be quite easy to solder new resistors back onto the shafts, or to re-solder ones that have become detached. I don't know what range the variable thermal resistors are, if we can determine this, we can probably buy replacements for pennies a piece from someone like RS. The likely temperatures will also indicate whether solder is sufficiently simple for fastening the wires to the shafts, or whether it might melt off under harsh operating conditions. There isn't a lot of point opening the module itself. The case is sealed and the contents are packed with silicon gel or something else that doesn't dry, so much like the HBC, you damage the unit while dismantling it. 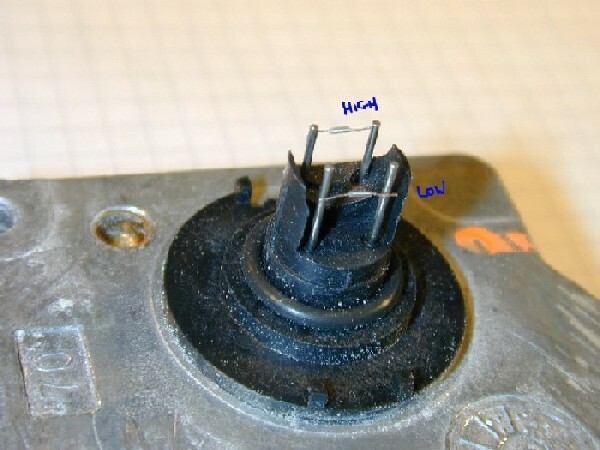 However, you could theoretically reconnect the three wires from the circuit board to the exterior electrical connector to the vehicle loom. How they might have become damaged in the first place is hard to imagine, and any other fault on the circuit board will obviously be beyond most of us to put right. 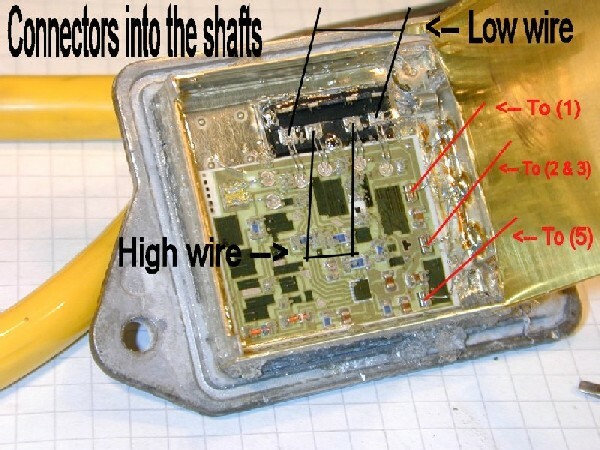 For the sake of completeness, though, the connections are as listed, the pads on the circuit board are joined to the black pads on the base of the plastic shaft and wire through to the four shafts on which the hot wires are soldered, all as shown. If the circuit board has ceased to work, I'd say that was irreparable. I would be surprised if the circuit board could be damaged by dropping the unit, in fact I can't imagine anything other than a substantial detritus striking the wires doing any damage, but heat or static shocks might see off the circuit board, e.g. due to a dodgy loom. So as a conclusion, there is more scope for repair than there initially appears, although more work needs to be done in this area to investigate what happens when this is attempted. In the first instance, I have a module with a non-working circuit board but with two hot wires that seem to be fine. If someone finds themselves with a MAF that has damaged or detatched hot wires, someone could try soldering the good wires onto the otherwise working MAF to see if it then works normally. Equally well, it would be good if someone could find out whether there are any differences between the MAF Modules, from one model to another. There are difference in MAF housing, but whether it is possible to swap modules from one housing to another and get normal readings is yet to be tested. Thanks to Martyn H for the text and excellent photos and to Craig for the sacrificial MAF.